I was trying to decide what to make for our work potluck and knew that Gingerbread Cookie Cups had to be it. 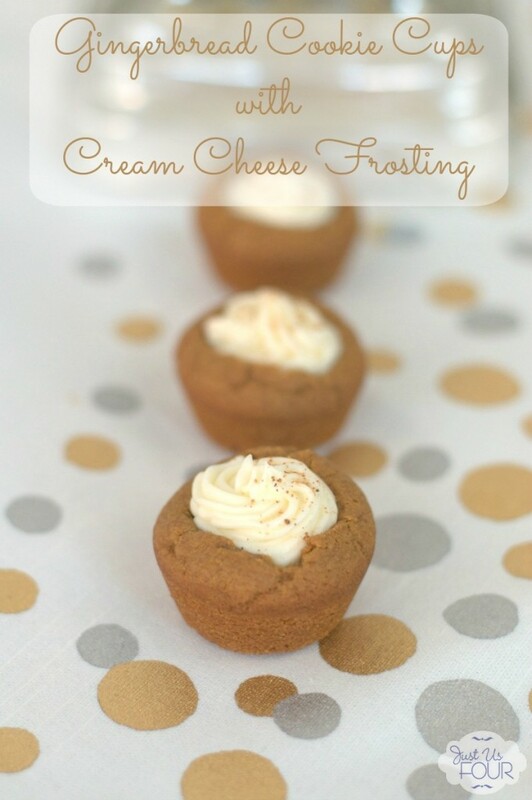 These soft Gingerbread Cookie Cups are the perfect little one bit size and are filled with a delicious cream cheese frosting. 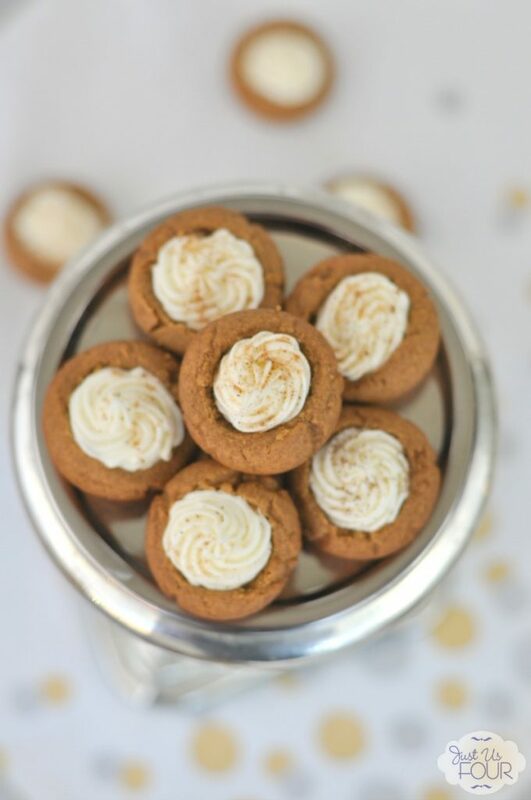 I have also made them with pumpkin cream cheese frosting (just use pumpkin cream cheese instead of regular) and think they are the best idea for a Thanksgiving dessert. 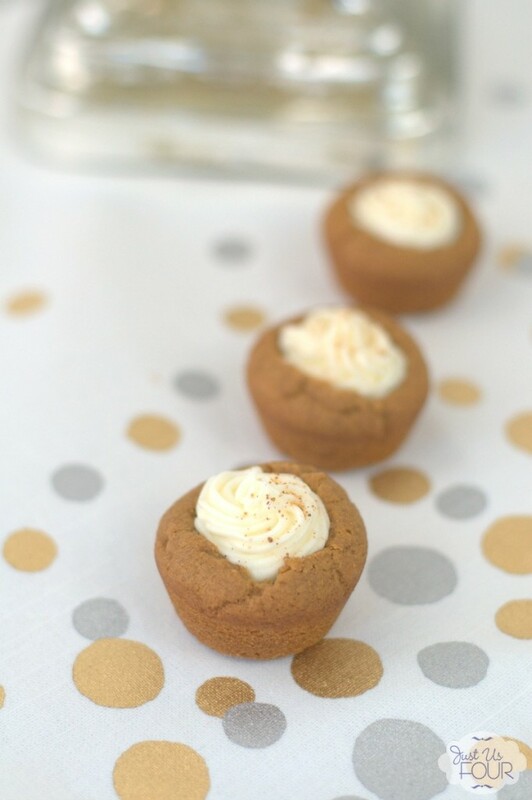 I absolutely adore these easy gingerbread cookie cups. Not only are the perfect size for grabbing and tossing in your mouth, they are the perfect combination of flavors. If you want, you can even use pre-made gingerbread cookie dough from the store in place of making your own. One roll will be just enough for this recipe. What are your favorite holiday desserts? Have you turned cookies into cups before? Cream together butter and sugar until smooth. Add in egg and yolk and mix until blended. Add molasses, ginger, cinnamon and cloves and mix well. In a separate bowl, combine flour, baking soda and salt. Stir gently. Slowly add to mixer, letting each addition mix in before adding more. Roll 1/2 Tbsp of dough and place into the wells of a mini muffin pan. Gently press with your thumb to create an impression. Bake for 10 minutes at 350 degrees. Remove from the oven and, with a small spoon, scoop out the middle of the cookie to create a cup. Cool completely and then remove from pan. Meanwhile, beat together cream cheese and butter until smooth. In 1/4 cup amounts, add in powdered sugar letting each addition fully mix in before adding more. With the mixer running, add milk until frosting is desired consistency. Pipe into the center of cooled cookie cups. Sprinkle with nutmeg. Yum! I love gingerbread and I can’t wait for the season I can make ninjabread men. Haha. Happy Thanksgiving!